Imagine that the leading stockbroker in a country closed its doors without giving any reason. Its clients would be in a panic and customers of rival firms would be very nervous. That is exactly what has happened to bitcoin, the leading pseudo-currency. The website of the Mt. Gox bitcoin exchange in Tokyo disappeared from cyberspace on Tuesday morning, with no explanation provided. The exchange had previously admitted to problems with “transaction malleability,” a bitcoin-world euphemism for susceptibility to hacking. Internet chat was intense. What looks like an internal memo from the company was circulating the web, stating that there had been thefts from accounts that Mt. Gox customers had assumed were perfectly safe. It is not clear whether the document is genuine. The price of bitcoin on other exchanges dropped 8 percent, down 55 percent from last November’s all-time high, according to bitcoinaverage.com. If Mt. Gox were an officially licensed broker, the government would be the first port of call. The relevant authorities would investigate and might even make good on some losses under a taxpayer- or industry-funded compensation scheme. Of course, if Mt. Gox had to meet government-mandated security standards, it might not have been allowed to operate without correcting a software vulnerability identified as far back as 2011. But bitcoin’s central appeal is that it is free from government interference. That is not quite true, since bitcoin cannot make illegal activity legal. Bitcoin entrepreneur Charlie Shrem was an industry leader until his January indictment for attempting to use the techno-currency to launder money. Still, the distance from the official world is great enough that Mt. Gox customers are almost totally on their own. The purported internal memo suggests that other bitcoin fans might help out, so as to salvage the would-be financial asset’s reputation. That’s a thin reed to cling to. The expensive regulation and political backstops of conventional money are far from foolproof – look at the recently released Federal Reserve minutes from 2008 to see dysfunction in action. But the system is better than any known alternative, including one based on sophisticated software algorithms. Protester Aaron holds a placard during a demonstration against Mt. Gox, in front of the building where the digital marketplace operator is housed, in Tokyo February 25, 2014. The website of Mt. 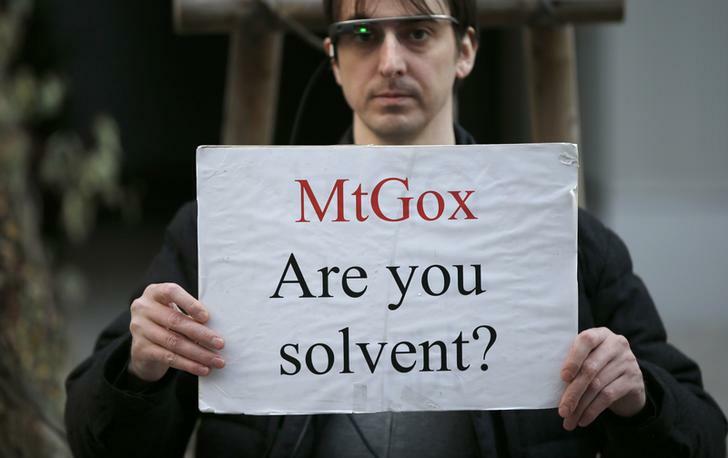 Gox, once the world’s biggest bitcoin exchange, went offline on Feb. 25, with its founder unaccounted for and its Tokyo office empty bar a handful of protesters saying they had lost money investing in the virtual currency. It was not clear what has become of the exchange, which this month halted withdrawals indefinitely after detecting “unusual activity.” A global bitcoin organisation referred to the exchange’s “exit,” while angry investors questioned whether it was still solvent.